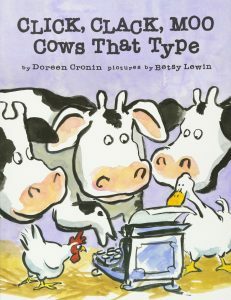 CLICK, CLACK, MOO Cows That Type is one of the first picture books that we ever bought and we still find it as funny now as we did when we first read it. The twist at the end of the story really makes us laugh! The Story: Farmer Brown’s cows type him a letter asking for electric blankets for their barn. When Farmer Brown says no they go on strike swiftly followed by the hens who would also like blankets. Duck, the messenger, is kept busy as Farmer Brown starts sending letters too. Can Farmer Brown come to an agreement with his cows and hens? And is Duck’s position as neutral as it first seems? This story, with its repetitive refrain pits Farmer Brown against his farmyard animals. The addition of a typewriter with its repetitive phrase, ‘Click, clack, moo. Click, clack, moo. Clickety, clack, moo.’, adds to the hilarity although we find the animals’ demands quite reasonable considering the cold conditions that they are living in! Betsy Lewin’s illustrations complement the text perfectly, they’re bold, bright and extremely comical. 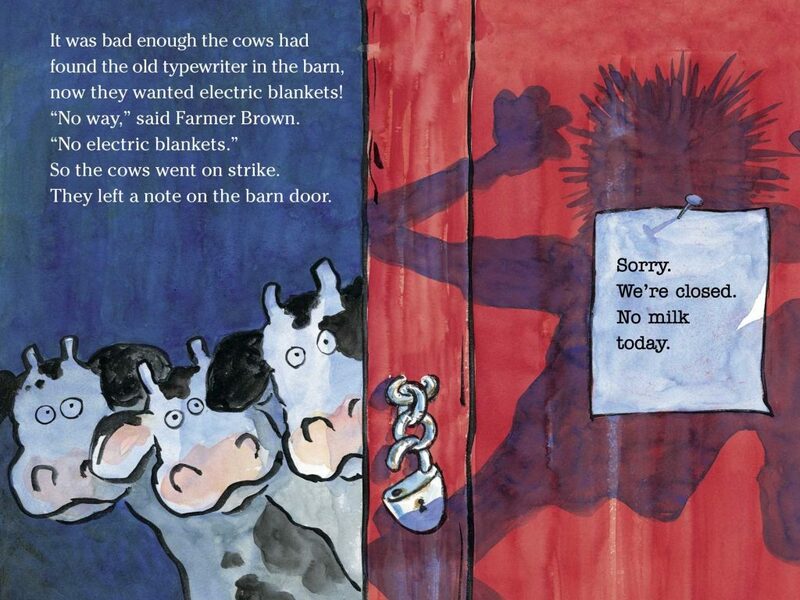 It’s hard to choose a favourite but we love the picture of the cows looking round the barn door after posting a sign to say they’re going on strike, the silhouette of Farmer Brown is a brilliant way to show how angry he is! We also love the final image with Duck and the typewriter but we won’t spoil the story by telling you what he and his friends are doing! 🙂 I hope you enjoy the story. It’s definitely got a fun refrain – clickety, clack, moo!